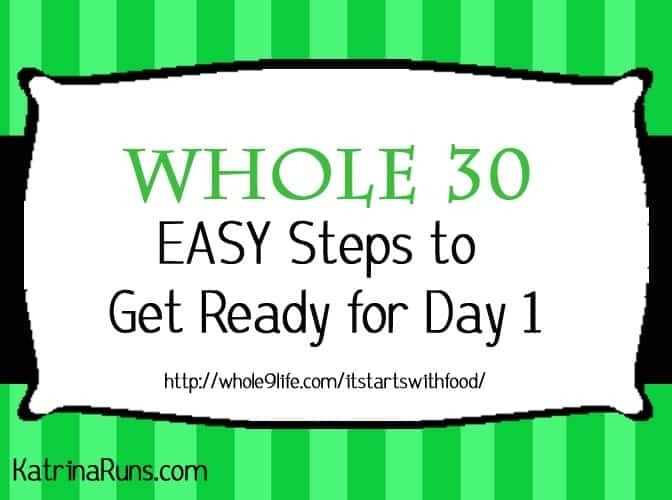 So, you’ve read the book or at least some info about Whole 30 and you want to get started RIGHT-NOW-RIGHT-THIS-SECOND-LIFE-IS-GOING-TO-BE-GREAT!!!!! Since this isn’t my first rodeo let me share some advice before diving in head first to the shallow end of a very tricky pool. Sugar It’s been a great summer. I enjoyed a few end-of-school celebrations, went on vacation for a few weeks, and visited families for birthday celebrations. I’ve relaxed my food intake to include more sugar and other things that have brought back some inflammation and joint pain. But I know I need to tighten up before sugar becomes an addiction again. Weight: My weight has actually been steady for a few months and I’m the lowest I’ve been in years. However, I need to start losing again. I’m not at my goal weight range, yet. 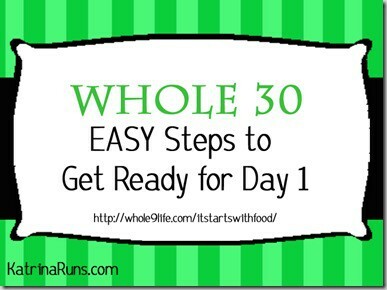 Race training: I’m also starting an intense marathon training series and I need my diet to be as clean as possible. I know how horrible it feels to run with so much inflammation everywhere. My cardio system suffers incredibly with too much sugar and starch. Prepare. This is going to be 30 days IN A ROW. You can’t pick and choose which 30 fit in your life. If a big celebration is happening in the next 30 days, prepare for it. If the next 30 days are overloaded with summer vacation celebrations, back to school dinners, birthday blowouts, you may want to hold off. In the book, It Starts With Food, the authors suggest a time of year for down time. Mid summer might not be the best for you. I certainly know that October-January is off limits for any kind of 30 day plan. But Summer works for me. What am I doing to prepare for Day 1? What worked for me last time? 1. Read It Starts with Food. There is a TON of information about the Whole 30 program, but there is also a lot of misinformation. For example, a few months ago, someone published a cookbook on Amazon using “It Starts With Food”in the title. However, it was as far from the program as it could get. It took a while for the book to get a disclosure statement from the original authors of the trademarked ISWF plan. That’s just an example of misinformation. Take a few days, read the book, and know up front what the plan is all about. 2. Plan a week of meals, prep a few dishes before the first day. I normally plan my meals by the week anyway. But especially before a more restrictive food plan, I prepared EVERYTHING! I made a huge pot of soup that I could have on hand at any time. I made some protein, a breakfast casserole, pre-wrapped some snacks, and I wrote it all out on paper. I didn’t leave anything to chance. Each week, I followed a similar blue print. I made 3 big meals: a soup, a big batch of protein, and a big pan of sweet potatoes. Those 3 things are still in my rotation 6 months later. This hurt. A lot. Because Stephen wasn’t doing this plan, I kept a few things around that I use for his meals like flour and cornmeal. Everything else went to the food shelter. Getting rid of sugar and dairy was tough. Yet I knew what my trigger foods were so I got rid of them. 4. Go shopping. Make a list. Stick to it! Once I am ready to do these 4 things, all that is left is following the plan. The first day is hard. Once I got through the first day, I refused to slip up the second day. The days just rolled away until Day 6 or 7 and I saw real results in the form of less headaches, amazing loss of puffiness in my face and fingers, and my joint pain disappeared. For more information, check out these free guidelines from the Whole 9 site.